When the first transistor was unveiled in 1947 it was a lump of germanium with wires sticking out of it – and it would have been very difficult to convince folks that 60 years later the average person would be carrying millions of transistors around in their pockets. Just a few years ago a typical quantum processor was a bench-top full of lasers and optics – or perhaps a vacuum chamber containing trapped ions. 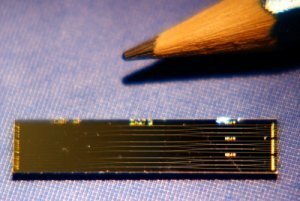 But now, several labs around the world have worked out how to integrate these components onto a single chip. A few weeks ago I visited one such lab at the University of Bristol, which is just up the hill from physicsworld.com headquarters. My host was the physicist Jeremy O’Brien, whose work we have covered in the past – and who has also helped us to make sense of recent developments in quantum computing. One of Jeremy’s main projects is integrating optical components onto a chip and he showed me a controlled NOT (or CNOT) gate that had been built in his lab (pictured above with a pencil tip). The CNOT gate is a fundamental building block of a wide range of quantum information circuits and could find use in quantum computers, quantum metrology or quantum cryptography. It took O’Brien and his team five years to take the CNOT gate from a bench-top implementation to a chip. 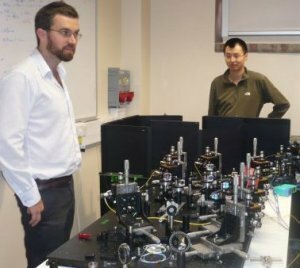 On the right is a photo of O’Brien (left) and colleague Xiao-Qi with a typical bench-top implementation (though not of a CNOT gate). While the Bristol physicists have done well to fit all that kit onto a tiny chip, the job isn’t actually complete. That’s because the device doesn’t include the photon sources and detectors needed to perform a calculation – these are still bench-top components. Adding on these components will take another 5–10 years, according to O’Brien. And then there’s the sticky issue of making a compatible quantum memory. Strictly speaking, a quantum memory is not needed in a quantum computer because the inputs and outputs could be classical bits of information. However, a quantum memory would be handy in some cases – and to this end O’Brien and colleagues are looking at the use of quantum dots.The lab tour was also my first real-life encounter with "blingtronics", which among other things is focused on the use of diamonds to create quantum bits (or qubits). Diamonds are crystals of carbon that contain a few nitrogen atoms here and there. Each nitrogen atom is accompanying by a neighbouring vacancy (a lattice site with no atom) and resulting "N-V centre" includes an electron spin that is extremely well isolated from the outside world. This means that the spin could operate as quantum bit of information (or qubit) at room temperature. This is unlike most stationary qubits, which must be cooled to near absolute zero to prevent them from being destroyed by noise. However, this splendid isolation has its downside because it makes it difficult to use N-V centres in a quantum processor – some interaction is required for information to be exchanged. Now, Mikhail Lukin and colleagues at Harvard University have managed to entangle a single photon with an N-V centre, a process crucial to quantum processing. If you have access to Nature you can read the paper here.